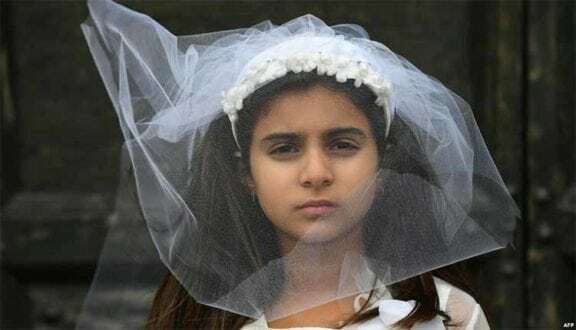 Radiofarda – The story of an 11-year-old girl, Raha, has once again set off another round of muscle flexing by ayatollahs and Shi’ite sources of emulation over the legal age for marriage. After outcry by Iranians on social media, an official of Iran’s Welfare Organization announced on February 10 that Raha has been transferred to one of its care centers. The ultraconservative elderly ayatollahs, officially called Shi’ite sources of emulation, have repeatedly insisted that when a girl reaches puberty, regardless of age, she is allowed to marry with her father’s consent. But there have been a few dissenting voices. One of them is a pro-reform cleric and “unofficial” source of emulation, Grand Ayatollah Assadollah Bayat Zanjani, who has openly challenged his fellow jurists over the issue, decrying child marriage as “illegitimate and against religious principles” and therefore harmful to the religion. “Since marrying underage children is unfair, it is illegitimate”, the state-run Iran Labor News Agency (ILNA) quoted Bayat Zanjani as saying. Bayat Zanjani’s comments were a direct response to several officially recognized grand ayatollahs who recently asserted that underage girls reaching puberty may marry with their father’s permission. On December 4, a prominent member of the Islamic Republic’s Cultural and Social Council for Women defended child marriage, arguing that it protects girls from a life of prostitution and illegal abortions. In contrast, “unofficial” grand ayatollahs are supported by their followers and their cash donations. As a rule, most of the “unofficial” grand ayatollahs and the Shi’ites’ sources of emulation in Iran prefer to stay away from politics and cases that might pit them directly against the regime’s official positions. According to Iran’s Association of Children’s Rights, the number of girls married under the age of 15 jumped from 33,383 in 2006 to 43,459 in 2009, showing a 30 percent increase over three years. The reasons cited were deepening poverty and parents’ apparent desire to rein in their daughters’ sexuality. Iran’s Civil Code stipulates that the legal age of marriage in Iran is 13 for girls and 15 for boys. However, the law allows girls as young as 9 to marry with their father’s consent or the permission of a sitting judge.